about the love of God to be found in Christ: Evangelists spouting hollow certainties and politicians exercising power on behalf of the most invulnerable are phenomena likely to remain with us for a very long time. There will always be individuals and groups of people with whom we do not identify, persons whose choices and behaviors offend us and who do not identify with us. There are so many reasons why we might want to cross the street or the room to avoid them, or to withdraw into the comfortable company of those with whom we agree and who often look and think like us. There are so many reasons why our eyes might be clouded and our ears might be clogged, and yet none of them would be sufficient in the mind and heart of Jesus who lived and loved among religious hypocrites, haters, political oppressors, collaborators, the least desirable, and the most vulnerable. Jesus would call us to more. He would ask us to forgive again, to try again, to set our hearts upon love again. Then, and only then, might we see, hear, and meet him in those with whom we share this journey and might they see, hear, and meet him in us. Every Lent we face up to the struggle of acknowledging who we really are. We continue the battle with the principalities and power in our lives and histories that prevent us—not entirely against our will—from actualizing our true identity. Spiritual autobiography, the telling of our stories, is a formal way of reflecting upon our relationship with God. We look for the presence of God and God’s leading by examining the events of our lives, important relationships, joys, and sorrows. In this process of self-discovery, we find clarification about who we are and to whom we belong. We seek the prayerful self-awareness that leads to repentance and change and brings us closer to God. Is this navel gazing? Quite the opposite, it is a way of living our lives that is more attune to what God would have us do, and what Jesus has shown us to do, which is to love and serve, freely and unconditionally, without the hope of return or reward for ourselves. of others, to deepen our experience of faith and love among this community who gathers in the name of Jesus. We will walk him through the wilderness experience of dryness and longing for God as we make our way to Jerusalem and the cross. As we prepare to celebrate the Third Week of Advent and to light the candle of joy, I share with you the poem "Gaudete," which means rejoice in Latin, by Brad Reynolds. This Sunday, we also celebrate in the ordination of Chaz Howard to the Transitional Diaconate. Please join us as we rejoice in these blessings which grace our community and give thanks to God! With these words, the prophet Isaiah announces a new chapter in the life of God’s people. Fasten your seat belts and get ready to drive down that highway out of the desert. The world is about to be transformed; a new revelation is taking place. Five hundred years later, as he echoes Isaiah’s words, John the Baptizer announces another new chapter: The appearance of the one who is greater than he, the one who will baptize with the Holy Spirit, the one whom we know to be Jesus the Christ is coming and that is good news, indeed. Roads are powerful metaphors for us, metaphors for life’s journey frequently occurring in song and poetry. Characteristically in literature, the road is a place where interesting things happen to people, where you meet strange characters, and where transforming encounters occur. In our own vernacular, we parse roads quite precisely. We have back roads, river roads, freeways, throughways, parkways, toll roads, and turnpikes, etc. With all this particularity, what might a highway for God look like and what might happen there? Isaiah tells us that it will be a smooth road, no bumps, no rough places, but I wonder because the road that Jesus walked was never easy. The road is also a potent metaphor for own lives and we know that the road we walk is not easy either, especially when no one realizes how hard that walk has been. Because the road is not easy and the waiting is often difficult, even after proclaiming the coming liberation, a voice from Isaiah’s road, declares, “Cry out and I said, what shall I cry?” Out of the depths of both my pain and my hope, what shall I cry? This season of Advent is a time when we give voice to that cry while waiting and longing for God to come among us once more among us to reveal deeper meaning and direction for our lives. Perhaps we wrestle with the losses that come with physical illness, aging, or addiction. Perhaps we long for the healing of a world beset by the senseless violence and cruel inhumanity that stuns and breaks our hearts. Perhaps we hope for forgiveness or the capacity to forgive, or comfort in sorrow, or courage in adversity, or the end of a long loneliness. When we are beset by all that causes us to cry out, we can do what John the Baptizer could not do. We can recall that vision of the kingdom given to us through Jesus’s life and teaching. Ironically, even as we anticipate the birth, we can turn to the resurrection. In that, pivotal, transformational event that John did not live to experience, we have a different lens for seeing God’s activity in the world. We can trust that the light of the world cannot be extinguished and that we have a hope and a future in God in Christ. No matter how alone we feel or how heavy is our darkness or how difficult the state of the world, the God of compassion and mercy is with us, ready to speak tenderly to us. It is a great mystery that we are never alone, but still we wait for the Messiah’s return and the fulfillment of the kingdom which he inaugurated. Waiting for that return in the near or distant future is one of our great challenges. Where is it that Woody Allen said, “The future is a lot like the present, only longer?” We live in the tension of what is often described as the already, but the not yet—waiting, seeing occasional and unexpected glimpses of the kingdom in us and among us which are all too fleeting. Like John the Baptizer, we can also be pavers of the way, even when like him, we cannot fully see or imagine what that way will be. Instead of being immobilized and demoralized by the disparity between our expectation of kingdom and the painful realities of this world, we can transform our outrage and our sadness into love in action, as we become the hands and heart of Christ in the world. In Advent, we hold our breaths and wait, trusting and praying that this time is also a time of transformation and growth and that God in Christ will break through once more with unimaginable gifts. Among these gifts are the courage to move on down that road, toward a hoped for future, remembering this one who came and who will come again and who is with us always. This Sunday, we move into a new Church year with the beautiful liturgical season of Advent. Advent invites us to look forwards and backwards simultaneously. We prepare with joy for the coming of the infant Christ into the world and we wait with longing for the return of Christ in the parousia, the original Greek word for the second coming. As we light the candles in the Advent wreath each week and move closer to the realization of the birth, our sense of expectation increases. We are more aware of God doing something new among us in the incarnation, the revelation of God in Christ. Throughout this season, as we savor beautiful readings from the Hebrew Scriptures which recount the yearning of God's people for their Messiah, we long for our Messiah to come again and reconcile the world to God, to bring the peace that passes all understanding. transgressions. We see it in the liturgical use of the color purple as in the season of Lent. While Advent is certainly not a somber time as in Lent, it can be a disciplined time for prayerful self-examination and attention to our own spiritual journey and relationship with God. things only one day at a time. Insight doesn't help here. Hope is not logical. It always comes as a surprise, just when you think all hope is lost." In the face of this, the best thing, she says, is "you have to take the next right action." If this comes close to how the prospect of Advent is feeling for you right now, take action. Stay close to the community. Come to church. Enter into the beauty of worship. Participate in the Cathedral's Advent offerings of retreat and study. Call a friend. Call a member of the clergy. Trust that our God, who is revealed in the most unexpected ways, times, and places, is coming again and is with us now. Allow yourself to be surprised by hope. On the week preceding Thanksgiving, we celebrate In-Gathering Sunday in the Cathedral. It is a day in which we commit to sharing our faith, our resources, our time, and our talents to further God’s kingdom in our community and in our city. It is also a day when we invite you to finalize your annual pledge and then place it in the offertory basket as a sign of your response to God’s love and blessings in your life and in the life of this faith community. In the first letter of Peter, we are given the words, “As each one has received a gift, use it to serve one another as good steward’s of God’s varied grace.” They strike me as being especially appropriate for our community which is so blessed by gifts and giftedness, as well as varied expressions of God’s grace. We have opened our hearts and our doors to serve those in the community around us, the Episcopal Diocese of Pennsylvania, and all the seeking souls who have passed our way. Our worship has inspired and strengthened us and countless others as we have gathered to give thanks and praise to God. Members of our community have given of themselves in so many ways in this past year. We have witnessed the growing ministry of our Cathedral Table programs, and our partnerships with the University City Hospitality Coalition and Our Closet. We have provided spiritual formation opportunities for children and adults, and widened our expression of faith through the beauty of music and the visual arts. These are all signs of God’s varied grace moving among us. The Holy Spirit has moved to shape and form us into the Body of Christ—the loving, caring, generous community for which we gave thanks. In this spirit of thanks and in response for all the ways in which God has gifted us, each one of us is called to be a good steward of that varied grace. A portion of that response is through financial stewardship in the form of pledging. A pledge is a commitment to give a specified amount of money in the coming year. More than that, it is a commitment to yourself and to God to be an intentional giver. We understand that circumstances sometimes change and that it may be necessary on occasion to adjust that commitment. But much like individual households, its helps us to know approximately how much financial support we can count on as we plan for ministries and expenses such as salaries, heat, electricity, and snow removal to assure that the doors of the Cathedral remain open and that we continue to serve. Please take some time to reflect upon how you and this community have been gifted by God and respond generously to those gifts by completing a pledge card at a level that feels right for you and bringing it to the Cathedral on Sunday, mailing it in, or responding through our website, www.philadelphiacathedral.org. This fall, we have celebrated a Season of Creation, a special time set apart between Homecoming Sunday and our observance of the Feast of All Saints. We have added to our Sunday liturgy beautiful prayers, hymns, and psalms which address the beauty and interrelatedness of God’s good creation, of which we are an integral part. The psalm appointed for this final Sunday, which we will sing together in modified Anglican chant, could not be more beautiful in its description of the divine presence in creation. The psalmist sings of God’s goodness, plenteousness, and merciful intention for our world and of our corresponding joy and gratitude. At a time when our planet feels besieged with extreme weather, hurricanes, floods, and droughts, these images are an almost painful reminder of how we have disturbed and polluted the natural order. At a time when so many are hungry and without adequate shelter, the contrast between God’s intention and the failure of human stewardship is clear. I urge you once more to adopt the passion of our Cathedral Youth in responding to these issues, in ways both small and large, personal and institutional. Please visit our website: www.philadelphiacathedral.org to view their presentation and to learn more. Our Season of Creation in the Cathedral is drawing to a close as we prepare to celebrate All Saints' Day on November 3rd. During these past weeks of beautiful prayers and blessing, there has been much concerning news issued about the state of our environment and the prognosis for its future unless major changes are undertaken by the nations of the world. Our children shared with us last Sunday their passion for this topic and their deep concern for the health of the earth which they shall inherit. Please review their slide presentation on the front page of our website for stunning information about the proliferation of plastics in our environment and ideas about the difference that we can make in the Cathedral and in our own households. Please also stay tuned for opportunities for more discussion about how we as a community might lift and add our collective voice to effect systemic changes for climate justice. Why is it a justice question, you might ask? Because those who suffer disproportionately and the most from climate change have the least power to stop it. Caring for the creation is a holy imperative, a sacred responsibility to and with our Creator, whose presence infuses the entire creation and our own souls. From the U.N. Environmental Sabbath, "In your Goodness You have made us able to hear the music of the world. The raging of the winds, the whisperings of trees in the wood, and the precious voices of loved ones reveal to use that You are in our midst. A divine voice sings through all creation." We have an important role to play in assuring that the divine music plays on for the generations who follow us on this planet home. Many of us grew up reading Dr. Seuss’s fable, The Lorax. Reputed to be the author’s favorite book, it recounts the story of a creature called a Lorax who lived in a beautiful valley. One by one, the exotic Truffala trees that populate the region are all cut down so that their silk-like leaves may be used for the mass production of a very special garment to be sold at an exorbitant price. The Lorax tries to reason with the manufacturer and “speaks for the trees” who have no voice of their own, but to no avail. Eventually, the air and water are polluted, the wildlife leaves or dies, and even the factory cannot be sustained. The Lorax is finally lifted up into the air “by the seat of his pants” and disappears into a smog filled haze. All that remains of him is a marker where he last stood bearing one word—UNLESS. The manufacturer, who has wreaked this destruction through his greed and self-interest, spends some time contemplating the word and finally realizes this: “Unless someone like you cares a whole lot, nothing is going to get better. It’s not.” Standing in the midst of his ruined factory, he hands a boy the last Truffala seed and urges him to plant a forest so that the Lorax and the other creatures will return. This past week, the United Nations scientific panel on climate change presented the world with the equivalent of a giant UNLESS marker. Unless, greenhouse gas emissions are reduced dramatically in the next years, the atmosphere will warm by as much as 2.7 degrees Farenheit by 2040, creating droughts, severe weather, flooded coastlines and lowlands, and wildfires. Further, such dramatic climate change would threaten the world’s food supply and expose millions of people to disease, starvation, poverty, and homelessness. The U.N.’s prognosis is dire unless we act now. This Sunday in the formation hour, our children will share with us their ideas about how we can help. Responding to the imperative in Renewing Our Covenant, our congregation’s statement of commitment and action, they have considered how we might together “fight for climate justice and protect our environment.” Please come and support them and bring your own ideas, too, of what we as a community might accomplish together because, as the stewards of the beautiful creation that God has given to us, our cumulative actions matter. 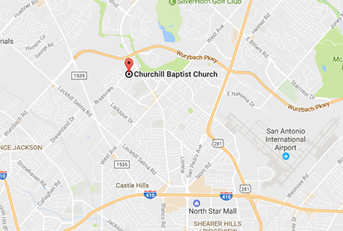 Many of you know that my own spiritual journey to the Episcopal Church was a circuitous and some might say, unexpected one. I graduated from a women’s college in which women were not only prepared for leadership but held the majority of leadership positions in the faculty and administration. After immersion in that culture, it was something of a jolt for me to encounter an imported male priest at the Sunday morning Roman Catholic mass held on the campus who did not share the same values of participation at all levels for women in the Church. It should not have been a surprise. Those experiences, combined with theological and historical study of Roman Catholicism that troubled me deeply, led me to walk away. And because I was formed in an era when Catholics were instructed that all other Christian denominations were “in error” and had abandoned the “one truth faith”, I didn’t know where to go. I am intensely grateful that my family life and personal faith have been and continue to be informed by both Judaism and Quakerism and I have deep love and respect for both of these traditions. After a time, though, I found that I longed for sacraments and hymnody; I longed for the rituals of my childhood which had shaped what I like to call my religious imagination; and I longed for the community that finds its identity as the body of Jesus the Christ. In those years, I had quietly undertaken an exhaustive study of Anglicanism and the Episcopal Church. I often anonymously slipped in and out of the very back of weekday Eucharists at a downtown Episcopal Church not far from my office and loved what I knew of the liturgy. Still, the idea of crossing the threshold of an Episcopal Church on a Sunday morning was daunting even for me, a self-described extrovert. Daunting, that is, until a close friend who knew me well and had heard my longing invited me to come and see and experience what she had found and we crossed that threshold together. This Sunday, you are invited to bring a friend to the Cathedral. Who in your life may be looking for a deeper connection to God and yearning for a sense of community and spiritual home? Who is having difficulty crossing that threshold without your support? Please pray about this and reach out. We simply wish to share the love of God which we have found in Jesus and the joy and the fellowship of our congregation. Hopkins writes of the renewal, sometimes invisible, that is ever-present in the creation, including the natural world around us and our own souls. It is a renewal that we know and experience most profoundly and completely through Jesus the Christ, whom Paul describes as the “first born of creation”. Please join us this Sunday in worship and study as we explore more deeply God’s wondrous, invisible presence among us and are led more deeply into relationship with our Creator God and with one another. That inner reality for us is grounded in and transformed by the Christ, the creative, generative power of God which animates our world. We know it most fully in Jesus who is the Christ, the Messiah. Present at the very beginning, remaining, and eternally transforming, conforming, and redeeming the creation according to God’s continuing, evolving plan. In the twentieth century, Teillard de Chardin, theologian, scientist, and priest, articulated a developing recognition of Jesus as the Cosmic Christ, the unifying, creative force in the universe; joining matter, mind, and spirit. Teillard’s vision regarded the whole of created order, including human consciousness, in an ongoing movement, led forward by the Holy Spirit, in the process of becoming, until finally one again with God. We see this movement in the experiences of the great mystics of our tradition who knew this union through individual consciousness and also when our world is moved by the incarnate love, justice, and forgiveness which we know in Jesus. I look forward to seeing you at Homecoming, this Sunday, September 16th! This is a time of new beginnings as we launch a new program ministry year and gather once more to share the love of God through the Gospel of Jesus Christ. Please join us for worship and for the congregational potluck following. Your attendance this coming Sunday and throughout the year ahead is important to the life of the community and is a blessing to all of us! Our focus from Homecoming until All Saints’ Day in November will be a Season of Creation, a time set apart by many Episcopal and Anglican churches within in the long Season after Pentecost. In an ecumenical letter issued in June, 2018, the Most Reverend Justin Welby, the Archbishop of Canterbury, wrote: “During the Season of Creation, we join together to rejoice in the good gift of creation and reflect on how we care for it. This season offers a precious opportunity to pause in the midst of our day to day lives and contemplate the fabric of life into which we all are woven.” Prayer, music, and spiritual formation offerings will point us to deeper relationship and love with the Creator, whose presence we know most fully in Jesus; with each other; and with all of creation. Through worship, study, reflection, and fellowship we will also consider how we will address our Cathedral Covenant aspiration to contribute to the stewardship of the earth. Be ready to experience some changes in the look of our worship in the Cathedral for these next weeks! Tom for his many years of faithful service and we welcome him to this new chapter in his ministry. Wesley Parrot has also joined us as Cathedral Organist, succeeding the late John Andrew Bailey, and we welcome Wesley to our community. I am also delighted to announce a major pipe organ restoration project in collaboration with the Wyncote Foundation and Emery Brothers . Beginning in the fall of 2018 and concluding in the fall of 2020, Emery Brothers will install the fully restored Möller Opus 6425 organ (built and designed in 1936 by Richard Whitelegg, with 33 ranks) in the chancel chambers, and create a new two-manual Gallery (Antiphonal) Organ, to be comprised of selected ranks restored from the current 1903 Austin organ, with additions. A new, movable four-manual console on the floor of the nave will be created with full access to both organs. The full proposal and preliminary specifications may be viewed at the Cathedral websitewww.philadelphiacathedral.org. This investment in our organ and in the recovery of our choir loft will help us to realize long-held dreams. It will increase our capacity to offer a beautiful and expansive repertoire of music to the glory of God and in service to our congregation, our diocese, and our city. We are grateful to Adam Dieffenbach of Emery Brothers for inviting us to consider this project and to the Wyncote Foundation for providing the funding to make it possible. For some time now, we have been lifting up our new partnership with POWER as a central feature of the Cathedral’s growing advocacy ministry. POWER is a community organizing group which works with diverse faith communities in Southeastern and Central Pennsylvania to address local and statewide issues while simultaneously strengthening the life of our congregations. On Tuesday, July 10th, more than 100 people, including members of our own Cathedral congregation, gathered to attend a voter engagement training led by POWER. The goal of the training for this initiative is to get as many people as possible to register and vote in the November 2018 midterm elections. Campaign organizer, Kendra Cochran opened the training with a quote attributed to Martin Luther King, Jr.: "Our lives begin to end the day we become silent about things that matter." Voting is key to this belief, she explained, because voting is one of the crucial ways we do not become silent. Voting is how we elect officials who will advocate for the things that matter to us and how we hold them accountable beyond election day. For POWER, those things that matter include high-quality education for all children through a school fair funding formula, the creation of sustainable and living-wage jobs, the reform of our criminal justice and incarceration system, and access to affordable healthcare for all. These concerns reflect the same loving attention that we Episcopalians bring, through our baptismal covenant, to respecting the dignity of every human being. Congregations and faith communities will continue to learn more about voter engagement and registration in preparation for POWER’s “The People’s Movement” Voter Engagement Kick-Off on Sunday, August 26th 3-5 PM at Trinity Evangelical Lutheran Church (1000 W Main St Lansdale PA 19446). If you have additional questions or would like more information, please contact The Rev. Canon Sarah Hedgis. The New York Times ran a story this past week about the differing reactions of churches within one small rural town in response to a raid by Immigration and Customs Enforcement agents. In Mount Pleasant, Iowa, population 8,500, questions about immigration policy were no longer an abstraction: Townspeople witnessed the arrests of individuals and families, many of whom they knew and whose complicated stories they had heard. Debates about the merits of various instructions from Scripture broke out from Facebook to the pulpit as members questioned the confluence of their concerns about religion, law, politics, and the local economy. How these fractures in the Body of Christ must grieve our loving God! We, as a congregation, have responded and will continue to respond to the humanitarian crisis at our southern border. I urge you to follow the links provided by the Episcopal Church below in this communication and to continue to pray for all who are suffering. I also share with you this gentle poem by Edwina Gately from her book, There Was No Path, So I Trod One, that speaks to the healing of the world. Oh, gentle God, soften us! Oh, living God, soften us! the imprisoned and the hungry. to heal our hurting world. I am descended from refugees. My great-grandfather Eoighan Sullivan was chased by the British army who occupied his small town in southern Ireland and terrorized the Catholic population there. We’ve never been quite sure what the extent of his republican activities had been to warrant so much interest in him, but they were significant enough for him to escape by boarding a cattle boat bound for the United States. He entered the country illegally, seeking the political and religious freedom that had been denied him in the country of his birth. I think often of him and my many other Irish and non-Irish relatives who came here to find a better life in the 18th, 19th, and early 20th centuries. It’s hard not to think of them as I witness what is happening to families seeking asylum at our southern border. Our sacred scripture has given us at least two very clear imperatives: To welcome the stranger and to love our neighbor as ourselves. These powerfully overarching themes are repeated throughout our entire biblical canon. 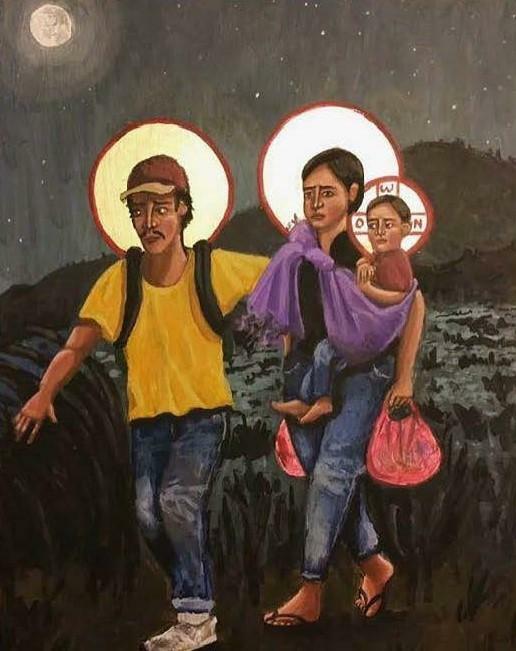 And we don’t have to look very far into the New Testament to know what Jesus, a refugee himself, would do when confronted with a refugee family fleeing for their lives. It is true that as followers of Jesus and members of the Church universal, we have an identity and affiliation that are larger than any nationality. Although the Church and our government have had a historically complicated relationship, I believe that it is also true that we have a responsibility to share our uniquely informed voice and perspective in the shaping of policy in the United States. Advocating for the dignity of every human being, as we promise to do in our baptismal vows, is not partisan politics; it is being Christ to and for one another in our universal human family. I share with you (Click here!) a poem and this image that were sent to me by my daughter. Her lineage, a generation later, is even more complicated than mine as it includes family members who were refugees from Nazi Germany. As you read “Home” and consider why it would be necessary for anyone to flee, I ask for your compassion and your prayers for all of those who are caught up in this terrible and painful moment in our nation’s history. I am writing to let you know that, for the foreseeable future, we will have a professional security presence on hand at the Cathedral during worship and other events. We have taken these steps to assure the security of all who cross through our doors and sadly, it is a precaution that more and more Cathedrals and churches are finding necessary. My hope is that the security presence will allay concerns rather than raise them. If you should have any questions, please do not hesitate to contact me directly. I will also be available to discuss this with you on Sunday following the service. We Episcopalians, interpret the Holy Scriptures as a living, continuing revelation of God’s word. We recognize the limits of human authorship and context and look beyond to the broader strokes and themes of God’s great love for God’s people. We, therefore, approach the Holy Scriptures in their entirety, embracing metaphor and the illuminating presence of the Holy Spirit in our humble efforts to begin to comprehend God’s love and intention for us. As long as we human beings have struggled with the Scriptures and their implications for how we live our lives, the dangerous practice of proof texting has been with us. It is the selection of isolated Biblical texts to justify human behavior which is very often antithetical to the broad messages of love and inclusion present throughout the entire Biblical canon, but revealed most completely for us in the life, death, and resurrection of Jesus of Nazareth, the Christ, as recorded in the New Testament. Biblical proof texting very often and very conveniently ignores the commandments to love, include, and serve. In the United States, the practice has been used to justify the removal of Native Americans from their lands, slavery, and other atrocities. Proof texting is now, once again, being utilized to justify the separation of refugee children from their families. The carefully limited text to support this action, which our Attorney General extracted from Paul’s letter to the Romans, advocates unquestioning support of the laws of the land; it was also invoked by the Nazis in support of their vicious and inhuman laws. This is an obscene use of God’s Holy word to support what is happening at our southern border and it can only be described as sin. There are moments when we, as followers of Jesus, must resist with a spirited and informed critique of our democratic system and when we must act. This is one of them. On Sunday and in our E-News communication, information may be found about how to contact your elected officials. Let’s start there. Families are complicated, don’t you think? The Church has become for many of us the family that Jesus describes. Like any human institution and family, it is also complicated and far from perfect. It is at its best when, as that family, we discern and live the will of God together and then serve a world that is so deeply and painfully divided. In these weeks before summer, our Cathedral small communities will be hosting House Church gatherings to which everyone is invited. Like the earliest followers of Jesus, we will experience together the joy of a simple Eucharist in the intimacy of someone’s home. This is a family time for sharing and affirming our bonds of faith and affection. I urge you to take part! Would that our answers to questions about the Trinity came even that easily! We do not find the word “trinity” in either Testament. While the Gospel of John provides numerous inferences to a reciprocal relationship between the Father and the Son, and points to the coming of the Holy Spirit, the Paraclete, there is no mention of the Trinity. In fact, the doctrine of the Holy Trinity was not developed until 325 when the Emperor Constantine convened the Council of Nicea, an event so beset by theological division and outright threat and intimidation that our current struggles seem quite restrained by contrast. Despite the certainty pronounced at Nicea, I take some comfort in Saint Augustine’s plainly stated words, “God is not what you imagine or what you think you understand. If you understand, you have failed.” Still, the doctrine of the Trinity is much more to us than a reminder of what we don’t know. It represents the inspired efforts of generations who went before us as they struggled to explain their own experience of God. Is the Trinity an exhaustive formulation for God? No. We also experience God as mother, friend, liberator, partner, jokester, promoter, deliverer, healer, listener, comforter, mountain mover. That’s just the beginning of my list and very often, I have no words. In the Jewish mystical tradition of Cabala, there are ten names for God and in Islam, there are more than two hundred. Even if we were to add all of these names for God together with our own, we would still never exhaustively capture the wonder, awe, and mystery that we know in our one, holy, and living God whose presence and activity defy human language and category and whom we recognize in the power of love. The great Feast of the Pentecost occurs this Sunday. In the account from the Acts of the Apostles, devout Jews from “every nation under heaven living in Jerusalem” have been drawn “all together in one place” in common purpose. Remarkably, out of their chaotic diversity, they are led to unity to become the Church as they speak and understand languages previously unknown. The Spirit of Truth, or as I translate from the Greek, the Spirit of Not Forgetting, has come among them to stir them up to tell the stories of “God’s deeds of power”: The stories of Jesus of Nazareth, the Christ unrecognized by many whose crucifixion, death, and resurrection exposed the injustice and evil of the world; whose vision of the Kingdom has brought hope and meaning and revealed God’s love. One of God’s greatest miracles is that two thousand years later, the Church is still here. Despite persecution, schism, denominationalism, and the sheer difficulty of being human beings “all together in one place,” we are still here and it is reason to rejoice. We rejoice that despite ourselves—our human errors, missteps, misreads, and failures of will, the Spirit of Not Forgetting continues to equip us to tell the stories and to strengthens us to be that visible sign in the world of God’s redeeming love. Just as on that day when a “rush of violent wind” and “tongues of fire” forged the new community, we rely upon the Spirit to lead us forward to find unity and a common vision and mission amidst our differences. Yes, this is grace and it is also very hard, necessary work. It requires humility and sometimes sacrificing our personal pieties and interests if we are to live God’s call to us to be a gathered people, a people who serve and who love in the name of the one whose humility and sacrifice brought hope and healing to the world. On Sunday, we will rejoice in new life and new beginnings as we baptize Wesley Joseph Valerio. We will also renew our own baptismal vows that provide the framework for how we live, love, and serve together as the community of Christ. May these reaffirmations renew and strengthen us for the continued life and mission of the Church. Each year on the Feast of the Ascension, we celebrate a quiet anniversary. Sixteen years ago, the Cathedral was rededicated following the completion of the reordering of its interior. This was a monumental effort led by my predecessor and friend, the Very Rev. Richard Giles, a priest in the Church of England whom Bishop Charles Bennison enlisted to bring change and renewal to the struggling Cathedral. For those of you who are new to our congregation, our Diocese, or the Episcopal Church, it is hard now to comprehend the controversy around the transition of the Victorian Gothic interior of the Church of the Saviour to the worship space which now serves us so well at the Philadelphia Episcopal Cathedral. The rededication made the cover of The Living Church in June, 2002. There was also a story on the front page of The Philadelphia Inquirer in the same year in which the changes to the Blashfield mural in the semi-dome were likened to the cultural vandalism of the Taliban in Afghanistan. For my part, I might not have made all the same choices that Richard made, but I rejoice in the light and simplicity of our Nave which allows for the unambiguous centrality of the principles signs of our worship—the altar table, the ambo, and the baptismal font. I give thanks for the flexibility afforded to us by the removal of the pews as we beautifully meet the liturgical needs of our Diocese, our growing congregation, and smaller groups seeking more intimate, contemplative worship and prayer. The reordered Cathedral has served as an inspiration for liturgical renewal and sojourners from around the world still come to visit us. Uniformly, I find that those few who still harbor resentment about the changes from years ago have never worshipped in our reordered space. I always invite them to come see what is given to us each week, the transformative experience of the living God in Jesus Christ as we worship and move throughout the Cathedral space and the love that we share. An important change in the status of our Cathedral clergy is taking place. The Rev. Bob Tate will be retiring in the next months. Bob has served as an Associate Priest and led the Visual Arts ministry for almost eight years. Though he will remain a member of the congregation, his last official Sunday with us will be on June 17, 2018. Exactly eight years ago today I was elected Dean of the Cathedral. I knew that there was a lot to do immediately to bring stability to the Cathedral and that I needed a trusted and skilled priest at my side. That person was Bob Tate, my friend and colleague of many years. We joke about how our emails crossed in cyberspace—As I was writing to Bob to invite him to join me at the Cathedral, he was writing to me to offer his help. The rest is history and with the help of God and all of you, much has been accomplished in the intervening years. We will celebrate Bob and his ministry among us following the 10am service of the Holy Eucharist on June 17th. In the meantime, please keep Bob and his wife Ann in your prayers during this time of transition. We are making some changes in our healing ministry. Previously, we have offered simple prayer and the laying on of hands each Sunday after the 10am Eucharist service on the Presbyterium. Henceforth, those who wish to receive healing prayer are invited to come forward to receive communion and then to proceed to the baptismal font area where they will be met by a pair of healing ministers, one of whom will pray for them and their loved ones. This interaction, in which God's holy and healing presence is invited, is understood as sacred and private so please wait patiently for your turn at prayer. Our healing ministers respect the need for privacy of those seeking prayer and will never inquire about or discuss these concerns outside this confidential setting. The ancient ministry of healing is recorded frequently throughout the histories of the people of God. In the Hebrew scriptures, healing most often occurs through the intervention of the prophets--The great prophet Elijah breathes life into the son of the widow of Zarephath; The prophet Elisha sends Naaman to wash in the Jordan River to cure his leprosy; Moses intercedes to cure his people of snake bites in the desert by directing them to gaze upon a serpent mounted on a pole upon. This image of the snake-entwined rod, the caduceus, remains a symbol of healing and a modern emblem of the medical profession. The Gospels are replete with Jesus' acts of healing in which demons are cast out, sight is recovered, and those who have been ostracized because of their infirmity are restored and returned to community. That Jesus understood healing to be a central part of his disciples' ministries in heralding the kingdom of God is clear. Luke reports in the ninth chapter of his gospel: "Then Jesus called the twelve together and gave them power and authority over all demons and to cure diseases, and he sent them out to proclaim the kingdom of God and to heal." Many acts of healing performed by the twelve are described in the Acts of the Apostles. In the intervening thousands of years, we have come to a more formal understanding through advances in medical science that the body, mind, and spirit are essentially and irrevocably connected. We have found that God, who is the ineffable source of all healing, may use a variety of interventions and means to restore health. Therefore, spiritual healing in the church today often occurs alongside the healing practices of medicine, psychiatry, and psychology. We also recognize that healing does not always mean that we are cured of our physical symptoms. Each Sunday, as we gather to draw close to the loving, healing power of God in our midst and to give our thanks and praise, please prayerfully consider if healing prayer is an option for you. I am just back from the Conference of North American Cathedral Deans which took place this year in Cincinnati, Ohio. Whether our Cathedrals be large or small, twenty-five or two hundred and fifty years old, the ministry to which we deans are called is unique within each diocese. In view of that singular role, our joy is very great in getting together from across the wide geography of the Church to talk about our common experience. Our conversations are lively, informative, and inspiring. While we agree and disagree on a full range of issues, usually liturgical, we are resolute in our commitment to the role of Cathedrals as the spiritual and liturgical center of each diocese, the holy place where all come together to offer the best of themselves before God in prayer. At a time when many of our sister Cathedrals are facing the challenges of diminished congregations and endowments, along with the expense of repairing aging buildings, interest in our Cathedral project remains strong. I was able to share in Cincinnati that we have just in the past week more fully realized some of our own hopes and dreams in the last phase of that project: The Offices of the Dean and Chapter have now moved officially from the Liem Azar Center to the home which was intended from the inception of the plan-the second floor of 3717 Chestnut Street. The Liem Azar Center has more than doubled in the space which we have dedicated to our deepening congregational, community, and diocesan ministries. And there is more to come as we serve together to assure, that with God's help, this Cathedral may truly live its mission as the seat of the Bishop, a home for the Diocese, and open door for all! In this glorious Easter season in which we affirm and rejoice in the resurrection of our Lord Jesus Christ and his triumph over death, we, as a community, are experiencing several joys and sorrows, births and deaths. We give thanks to God for new life and the many babies who join us in our congregation and we mourn those who have died and entered into the nearer presence of God. As promised, I am sharing with you the details of funeral arrangements for our former organist John Andrew Bailey. A memorial service will take place at the Great Hall at Bryn Mawr College on April 22nd at 2 pm. Marie McCullough has invited any who would like to share a remembrance of John to send it to her at mmccullough@phillynews.com. The benefit concert which had been scheduled for 4pm on that same afternoon has been postponed to September 16th, Homecoming Sunday, at 2pm in the Cathedral. My thanks to Suzanne DuPlantis, Jane Kamp, Tom Lloyd, Kevin McDowell, and Laura Ward for their graciousness in rescheduling this beautiful offering of their gifts on behalf of Cathedral Table Ministries. Please save the date. Finally, I share with you the beautiful words of the Pascha nostrum, Christ our Passover. This ancient hymn, which was translated from the Latin into English for inclusion in our first Anglican prayer book, speaks to the heart of our faith and our hope. so also in Christ all shall be made alive. Alleluia. AMEN. A few weeks ago, we as a community observed Ash Wednesday, a solemn day reminding us very literally of the sinfulness of our human natures and of our inevitable return to the dust of the earth. Ash Wednesday also launched for us the season of Lent, a period of forty days that has traditionally been a time set aside for study, prayer, and preparation for those receiving baptism and other rights of initiation at the Easter Vigil. The Church, in its wisdom, has long recognized that what is necessary in the preparation of its new members is also vital for the recollection and formation of its longtime members. Therefore, we have all been invited to prepare through "...self-examination and repentance; by prayer, fasting, and self-denial; and by reading and meditating on God's holy Word. And, to make a right beginning of repentance..."
As Holy Week approaches beginning with Palm Sunday, I invite you to deepen your observance by turning your loving attention more fully to Jesus through personal meditation and the common worship of our community at the Cathedral. Please make every effort to take your place alongside your sisters and brothers as together we walk with Jesus through the exhilaration of his triumphal entry into Jerusalem, through the solemnity of events taking place during his teaching in the Temple, through the poignancy of his final dinner among his friends, through his arrest and death and the silence of Holy Saturday, to the Easter Vigil. This is a holy time for us as we move from anticipation, shock, and grief to ultimately, joy and hope. But the depth of the joy and hope that we know is coming in Easter can only be fully realized in the context of the entire Holy Week experience. Please review the schedule of services and share this sacred time in the company of the Cathedral congregation. Together, as the gathered people of God, we uphold and remember all that we know of God in the loving life, death, and resurrection of Jesus the Christ. From Psalm 51, which we prayed together on Ash Wednesday and which is appointed again for the Fifth Sunday in Lent: "Have mercy on me O God, according to your loving-kindness; in your great compassion blot out my offenses." Hidden in those translated verses is a tiny word that appears 241 times in the Hebrew Scriptures. That word, transliterated from the Hebrew, is chesed which sounds like a cross between a sigh and breath. It takes longer to spell it than it does to say it. Biblical scholars have struggled from the beginning to find an equivalent in English or any other language, but it defies translation. Miles Coverdale, the editor of the Coverdale English Bible in the 16th century, invented a new word as he tried to capture the breadth of its meaning and he came up with "loving-kindness" with a hyphen. He then assigned it twenty-three times alone in his translation of the Book of Psalms. In many other places in the Bible, Coverdale has translated chesed as mercy, or goodness, or great kindness, or steadfast love. Martin Luther translated it simply as grace. St. Jerome came up with misericordia. They are all words struggling to define what cannot be easily defined or captured by our human imaginations-God's endless, insistent, relentless, self-giving love for God's people in spite of their repeated failures and errors. During the season of Lent, we are invited to return again to God through deeper self-examination and self-awareness. We find in our genuine repentance that same divine love, that same compassion for our human frailty, which transforms even the brutality and evil of Jesus' crucifixion and death into the hope of resurrection and can surely transform us. At the meeting of the House of Bishops which is now underway at Camp Allen in Navasota, Texas, Bishop Peter Eaton from Southeast Florida shared the following letter from Philip and April Schentrup, the parents of Carmen Schentrup, an Episcopalian youth who died in the recent shooting at Marjory Stoneman Douglas High School in Parkland, Florida. Carmen was a youth leader at St. Mary Magdalene Episcopal Church in Coral Springs, Florida. Our hearts are saddened for the loss of our beautiful little girl and the absence of her amazing presence, but we cannot be sad for Carmen. We believe that Carmen's murder was not part of God's plan and that God is saddened by the violence in this world more than we can know. We know that God's promise is for us to be with him in heaven, and in faith, we believe that Carmen is in heaven, in the loving embrace of God. She awaits us, loved and cared for. As our family struggles to pick up the pieces of our shattered lives, we ask the Good Lord daily for the strength to fight the good fight, to finish the race. In our attempt to heal from despair and grief, we are compelled to try and make the world a better place for our two remaining children and for all children. To that end, we implore you, as leaders of Christ's church, to address the issue of gun violence head-on. We ask that you make this a priority for the Church and to leave little ambiguity as to "what would Jesus do." The scourge of gun violence on this nation, especially with military assault rifles, is a problem of our own creation and counter to God's desire for peace and love. As a nation we can solve this problem, and as leaders of the Church in our country, we ask that you help lead the way. In Christ's name, we beg you to take action. We would also like to extend an invitation to all bishops to rally with our church, St. Mary Magdalene, and our diocese this March in Washington DC. We, along with our church family, will participate in the March for Our Lives this coming March 24th and would very much urge all bishops to come with us to stand up for the lives of children and for the ministry of Christ's church. One can only imagine the example of leadership and solidarity that such a showing could make on our fractured and divided country. In the wake of these ongoing, senseless tragedies, faithful, reasonable voices must be heard. I am grateful that our Bishops have rededicated themselves and the Episcopal Church to working for safe gun legislation and I ask you to please consider participating in the March for Our Lives on the Parkway in Philadelphia on Saturday, March 24th. I know that our Cathedral community will have a strong presence. In his poem, "Little Gidding" from The Four Quartets, T.S. Eliot wrote, "What we call the beginning is often the end. And to make an end is to make a beginning. The end is where we start from." I am a person who routinely reads newspapers back to front so this makes complete sense to me and the circularity suggested by Eliot's words reminds me of the rhythm of our liturgical year: The end of one season; the beginning of another. Time passes and Lent is here once more. One year has transpired since Jesus was driven by the Spirit into the wilderness before heading to the Galilee. A year inevitably full of colliding endings and beginnings for each one of us. Sometimes in our lives, the link between the end and the beginning is obvious and sometimes we can only find it with the benefit of hindsight: The giving up of one thing for the sake of gaining and learning something new that we would never have imagined. The disappointment that led to an unforeseen opportunity. The feared change that generated unexpected relief and peace. The failed relationship that made room for a great love. The appreciation for life and friendship gained from the vantage point of chronic suffering and loneliness. And sometimes the ending feels so sharp and so final that we cannot seem to find the link to anything positive at all. Each one of us has our own private and personal litany of these losses and concerns and the deaths of loved ones tops the list. Like a dropped stitch in our knitting, we are left only with a missed connection, a painful absence that will never be filled, a wound that we might doubt will ever be completely healed. In these moments, we turn to our faith which asks us to hold two beliefs in tension: An acceptance of the inevitability of human suffering and death, an ending, with the expectation that God will lovingly transform it into meaningful new life, a beginning. We hold together and explore this tension of the ending and the beginning throughout the entire year as we read the parables and the stories of Jesus' healing and changing lives in the Gospels. And we feel it most acutely during the season of Lent as we anticipate and prepare for Holy Week and Easter, the moment when God transforms the ultimate ending on the cross into the beginning that is the resurrection. That moment when illusions are torn apart and the stark terms of our faith are set before us once more. Living with this tension is an effort that takes intention. And it calls forth from us a deep desire to live more deeply in communion with God in Christ and to welcome Christ to live more deeply in us. Lent provides a time set apart in which to do that. The austerity here in the Cathedral-the draining of the baptismal font and the constraint of our movements-are simply to shift our consciousness and remind us our longing for that communion. The psalmist says, "Make me to know your ways, O Lord; teach me your paths. Lead me in your truth, and teach me, for you are the God of my salvation; for you I wait all the day long." This Lent we might ask ourselves, what does God have to teach us in the midst of that longing? What of God will be revealed to us in this Lenten season as we listen to one another and listen in the silence? What new beginning might we make even us as we face and accept inevitable endings and losses around us? This week our Gospel moves on fast forward to the delivery of what appears to be some very bad news: Jesus' first disclosure to his disciples that this glorious ministry will end in his death in Jerusalem. Peter, who alone has just a moment before understood Jesus' identity as the Messiah, resists the news. Fighting fear, disappointment, and the realization that the long awaited Messiah will not fulfill the long anticipated hopes of freedom, peace, and justice, he takes Jesus aside and tries to silence him. Definitely a mistake. Peter makes a lot of mistakes. We are given insight into his psychology not only through these stumbles, but also through moments of his brilliance, impetuosity, bravery, and cowardice. Because we are given complex details of his successes and failures, he is arguably the most accessible personality in the Gospels. After all, it is Peter who, like the irrepressible, smartest boy in the class, usually first blurts out an answer when a question is posed to the disciples. He is the one who dares to walk out on the water to meet Jesus and then sinks like a stone because of an insufficiency of faith. It is Peter who denies Jesus three times and it is Peter who runs into the water to meet Jesus at one of the post-resurrection appearances. This same disciple, who resisted and denied the news of Jesus' cross in our Gospel story, was also crucified by the Romans, perhaps capriciously in the year 64, to mark the tenth anniversary of Nero's reign. Archaeological evidence, suggests that the site of Peter's death is the location of the high altar at St. Peter's Basilica. But as is so often the case with religious stories, there are several "traditional" sites that capture our imaginations. 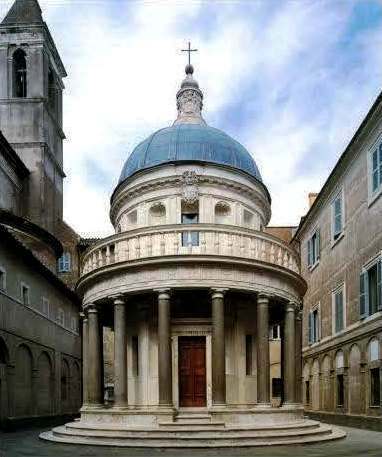 One of them is found on one of the seven hills of the city, on the campus of the Church of San Pietro in Montorio, where the Renaissance architect Bramante constructed a small, perfectly proportioned classical monument called The Tempietto. The interior is about as high and as wide as a cross. Around the interior of the monument's dome is written about this same mistaken man identified as "Satan" in this morning's Gospel, "Thou art Peter and upon this rock I build my Church." If there is hope for Peter, there is hope for each one of us. As we stand at the threshold of the Season of Lent, I include for you the homily which I preached in the Cathedral for Ash Wednesday (February 14, 2018). Ash Wednesday is a sober day in the life of the Church and for some of us, it is a very difficult and painful time. It's not comfortable to stop to acknowledge our sinfulness-what we have done and failed to do, or what has been done on our behalf that separates us from the love of God, or what has brought injury and pain. It isn't every day that we are reminded of our impending deaths, that we are but dust and to dust we shall return, by the smudging of ashes on our foreheads. When I was growing up in a tradition that focused more on sin than we Episcopalians typically do, the formal practice of confession was much more widespread than it is now. As children, we were encouraged to confess early and often. We would sit nervously outside the confessional and think very hard about all the things that we had done wrong, hoping to come up with a list of just the right length. No one wanted to be in the confessional too long, but you didn't want to be there for too short a time either. In we'd go, one by one, to enumerate the list, receive absolution, and then bolt to the front of the church to say the prescribed number of prayers, hopefully not too long, that were our penance, and then run back out to play. Completing a ritual that would be repeated many times but with more solemnity during the season of Lent. How well this worked for me as a child is hard to say and for those of you who know me well, I leave you to draw your own conclusions. But a few things have stayed with me from those early experiences. One is a love of religious ritual. The other is a big question about what real repentance look like. Jesus takes up that question in today's reading from Matthew's Gospel. Let's be honest. This is a tough text for people who love ritual and ceremonies, who love to gather in community for worship and prayer, and whose spiritual lives are shaped by the rhythms of the calendar of religious observance. Since you are here today, I strongly suspect that includes you. So why would we who gather to begin a holy season of repentance be instructed in this way? To pray secretly. To give secretly, not letting the left hand know what your right hand is doing. To wash our faces so that no one might see them disfigured by fasting and grief. The point, I think, is really about our intentions. Jesus tells us that we must not be like the hypocrites, which translates as "play actors", only in order to be seen. In the days of antiquity, it was apparently not unusual for many to engage in prayer and piety with great drama as public relations moments so that they might be held in high esteem. Today, those of us who go about our business with ashes on our foreheads on Ash Wednesday are sadly the exception, not the norm, and how the wider world reacts when they see them is complex and not always positive. While it feels a bit like we are being scolded, Matthew's text reminds us that even though we may not be hypocrites in the pattern of the Gospel story, our rituals and ceremonies-the signs, symbols, and the physical actions of our common prayer-beautiful and meaningful as they may be, are not enough in themselves to change our relationship with God. To contradict Woody Allen's view, in this case, showing up is not enough. Coming up with a quick list of sins, reciting the confession, and reflexively crossing ourselves at the absolution as I did as a child are not enough to transform our lives. If the ashes on our foreheads are only skin deep, if they don't signify an honest journey of the soul-a journey of inward longing and regret, an honest journey of inward movement towards God, than we might as well wash them off before anyone see us. Because then we WOULD be hypocrites; we WOULD only be acting. We know that engaging in religious ritual is not play acting. Our liturgies are not magic or mere occasions for public display. Sacraments, the cross, holy water, incense, and ashes are important and helpful because they point to truths beyond words, truths that resonate deep inside us. If they are beautiful, all the better, because like signposts on the road, they engage us and focus us. They help to open the way to encounter with the living God. Pointing the way to the loving God, who IS our center; who IS our treasure whether we stand alone in prayer or shoulder to shoulder with our heads bowed in a great crowd. Over the next weeks, these forty days of Lent, as we move with Jesus, closer to Holy Week and the inevitable journey to Calvary, look and listen carefully and reverently for the signposts of God's presence on your road. Take this season as a gift, as a time set apart to enter deeply into the mystery of your inward journey on the way to the Holy One whom we know intimately in Jesus the Christ. Turn off the automatic pilot and examine your life. Pray. Reflect. Meditate with Scripture. Receive communion. Reach out to help someone else who is searching. And sincerely, humbly beseech God, as we will do together in Psalm 51, to "have mercy on [you] according to God's loving kindness, and in God' s compassion blot out [your] offenses." Finally, trust that just as the death of Christ was and will be again transformed by the resurrection, that you, too, will be transformed. Not by shame. Not be elaborate gymnastics of self-denial. Not by the mechanics of empty ritual. But only by the loving kindness of God alone who responds to and is waiting for our real repentance. AMEN. With this Sunday, Epiphany, the Season of Light, draws to an end. We, like Jesus, climb down from the mountain top experience of the Transfiguration. We set our faces towards Jerusalem. We bury our Alleluias. And we come face to face with our sin and mortality on Ash Wednesday as we prepare to walk with him in the season of Lent toward the certainty of the cross. Before we go, the Celt in me longs to linger gratefully and just a little longer in this time of wonder and light. The season that began with the leading of a star and now ends with Jesus illuminated in bright white has shown us again and again the mysteries of the Incarnation. We have found the face of God most fully expressed in Jesus the Christ, and yet also present in one another and in the inherent goodness and unity of God's created world. Through Jesus' inauguration of the coming Kingdom of God, we have witnessed the power of God's transforming love and light to heal and to overcome the darkness that will never overcome us. The Irish teacher and poet John O'Donohue, whose little book To Bless the Space Between Us I keep close at hand, has written his own Phos Hilaron, hymn to light, which I include for you below. Put on the mind of the morning. Last week our Gospel story placed Jesus in the synagogue at Capernaum, the fishing village which I have affectionately dub Jesus Movement HQ. The now underground remains of Peter's mother-in-law's house are just a stone's throw away from the ruins of the synagogue. It's a very small town, a very intimate setting, where it was easier for me to imagine Jesus and the small band of recently assembled followers than anywhere else in the Holy Land. As I said in my sermon last Sunday, if there really were any place where the Messiah might rest his weary ahead, it is here in this place. We are told so little in the Gospels about the familial relationships of the twelve disciples and even of Jesus-a mother here, a brother there. So, it is a wonderful detail that Peter has a mother-in-law, and presumably a wife, whom he has not left behind when he makes his fateful decision to follow Jesus on the beach. Like so many women who appear in both Testaments, this mother-in-law has no name. We know only that she has a fever which Jesus cures, and then when restored, she immediately leaps up from her sick bed and serves them all. Hmmmm . . . From my acknowledged 20th/21st century perspective and social location, it seems to me that part of the plan for continued healing might have been some assistance in this regard. This is a topic that I take up fairly often, though, and I will save it for another day. What really holds my attention about this Gospel passage right now is what happens next: "That evening, at sundown, they brought to him all who were sick or possessed with demons. And the whole city was gathered around the door." In the morning, Jesus prays in a deserted place, and then announces to the ones who have tracked him down "Let us go on to the neighboring towns so that I may proclaim the message there also; for that is what I came to do." Here we have, my friends, the beginning of the burgeoning Jesus Movement. This is the launch of the journey that will take Jesus and the twelve from the safety of this haven on the north shore of the Galilee to the foot of Golgotha in Jerusalem. Very often when we reflect on that journey, we focus our attention rightfully on how the story ends because transformation and resurrection are our hope and our consolation. Yet, the beginning is also so instructive. Just imagine what we, as the body of Christ, can do together if we can recapture and convey that same excitement and sense of possibility on the open road before us as we set out "to proclaim the message" and "to do what we came to do." Two of the things that I love most about our Cathedral community are our spirited sense of adventure and our willingness to take risks to advance the Gospel. Even as we complete the last phase of our Cathedral Development Project with the construction of our new Cathedral offices and further open the Stephanie Liem Azar Cathedral Center for congregational, community, and diocesan ministries, so much is ahead on our collective journey. So, on this Fifth Sunday after the Epiphany, with the resolve found in the new beginning that is always available to us through Christ, let's get on with it. Let's do all that we came to do. We can fly like eagles! See you on Sunday because the Game doesn't start until the afternoon! I am increasingly troubled by changes in our national immigration policies, especially around the issue of DACA, or Delayed Action for Childhood Arrivals, for those persons known as "Dreamers." Dreamers number as many as 1.8 million young undocumented immigrants who entered the United States as children. Sadly, they have become pawns in a game of political brinksmanship. Yesterday, a long path to citizenship for them was proffered as a bargaining chip in exchange for new policies that will serve to further separate generations of families coming to the United States in hope of a better life. The fact that these policies specifically target immigrants identified as "unskilled workers" is further cause to challenge the motivations of those who propose them. And, yes, this political drama constitutes a religious issue for people of faith. Our Holy Scriptures are unequivocal in directing us to welcome the stranger. Jesus practiced a radical and holy inclusiveness that we who follow him embrace. We are bound to share the love of God that we have received in Christ, that love that is within us, with all the children of God's good creation. We cannot turn away from loving our neighbors with the compassion that we would hope to receive for our own families. I ask you to pray about this matter and to read several sources of new about it carefully to inform yourselves. If you feel led to action, the advocacy table will be in place in the Cathedral on Sunday morning, providing you with the means to write to your elected officials who are now actively wrestling with these issues. Am I alone in feeling as though we are in the midst of a rather bleak midwinter? Between the climate issues manifest in the freezing cold temperatures and the tragic mudslides in California, and the political rhetoric which is somehow sinking to a new low, it would be easy to feel discouraged. The Season of Epiphany, in which we tell stories of the revelation of God in our midst, shines a light in the bleak midwinter. Long before the term "epiphany" was coopted by the writer James Joyce, this short season wedged between Christmas and Lent has been reminding us of God's activity in our world. From the prophets of the Hebrew Scriptures like Samuel and Jeremiah who wrestle painfully, to Jonah who ends up in the belly of the whale, to the disciples like Philip, Andrew, and Peter who seem to join up immediately, we are given a host of very human characters in complicated situations who struggle to respond to the revelation of God set before them. We can chuckle at the sullenness of Jonah and marvel at the immediacy with which the fishermen throw down their nets, but they all have a lot to teach us about faith, trust, and yielding our lives to God's plan. We know that epiphanies certainly did not stop when the book was closed on our biblical canon. God, who through Christ has infused the whole creation with love and light, is still very present and has intention for each one of us. This is reason for hope. From the prophecy of Jeremiah, "For surely I know the plans I have for you, says the Lord, plans for your welfare and not for harm, to give you a future with hope." Our challenge is to open ourselves-our hearts, our minds, our souls-to apprehend the signs of that holy intention. While the psalmist says, sometimes "my soul in silence waits" and that wait can feel like the bleak midwinter, God is with us in that silence. And sometimes, if we are paying close attention, we encounter God in Christ in the faces of those around us and within our own immortal souls, quietly or with immediacy and power. The Season of Epiphany also reminds us that Jesus is for us the complete revelation of God. The voice from the heavens booms his identity; several unnamed biblical characters in our stories recognize him for who he is. Who is he in the story that you are telling? How do his life, death, and resurrection inform the choices that you make? How do you reveal that love and light of Christ in God's plan for you? The Holy Scriptures provide us with many examples of what are known as "call" stories, sometimes subtle and often not so subtle invitations from God to serve God's mission in this world. Some prophets of old heard a still, small unrelenting voice to which they assented, while others, like Jonah, were pursued actively by God as they ran in the other direction. And then there were those who encountered Jesus. When confronted with the person of Jesus walking down the beach, Simon and his brother Andrew drop everything without a second thought. In a moment, these fishermen become fishers of men, ready to proclaim his message, "The time is fulfilled, and the kingdom of God has come near; repent and believe in the good news." Mark gives us only these details and nothing more. This is little help to us when we marvel at the apparent sacrifice and wonder if we could do it, too. Could we walk out the front door of our homes or businesses, leaving family and loved ones behind? If not immediately, could we do it at all? Our own invitation to follow Jesus requires much of us, with risk, with joys and sorrows, gains and losses that we cannot imagine or foresee over the course of our lifetimes. It involves not only opening our eyes and our hearts to receive God's unique call to us, but also acting upon that call. We may not be asked to leave everything behind as Simon and Andrew did, to drop everything and go, but as followers of Jesus, we can expect to be changed. We can expect that answering will change our hearts and our minds because transformation is God's modus operandi in the world. We trust that the power of God in Christ will move and bend the creation, and even us, for the good of the coming of the kingdom. I've visited the spot south of the Galilee that scholars believe is the place where Jesus's baptism occurred. Trusting that the topography of the Holy Land hasn't changed too drastically in the last two thousand years, I can tell you that I was surprised. After years of singing "Michael Row Your Boat Ashore", I expected the River Jordan to be "deep and wide with milk and honey on the other side." What I saw was something quite different. When you stepped into the murky waters of the Jordan, the chances were good that while your sins may have been symbolically washed away, you would emerge covered in a thin layer of mud. So why would Jesus stand in line with the multitudes from the whole Judean countryside for this mud-coated experience? It is necessary and "proper," he says, that his baptism takes place for the sake of "fulfilling all righteousness." Echoing the Suffering Servant from Isaiah, he identifies as the one who has been "called in righteousness" to bring forth a new order of justice, thereby inaugurating the reign of God. Lest there be any further question about his identity, as he emerges from the water, the Spirit of God descends upon him like a dove and a voice from heaven says, "This is my Son, the Beloved, with whom I am well pleased." Then after a time in the desert, Jesus, filled with the power of the Holy Spirit, will set out to proclaim that "the kingdom of God has come near." Our own sanitized baptisms are tame affairs in contrast to this event on the shores of the Jordan. For most of us, if we can remember, there was little drama, no great sense of risk or danger, no hint of the unknown, definitely no mud, and certainly no doves. Yet because we are baptized in the name of Jesus, our baptisms are inexorably linked with his. Like Jesus, we are God's beloved. The voice we hear may not boom from the heavens, but it tells us all the same that we are deeply loved, deeply blessed in all of our unique humanity and vulnerability. Henri Nouwen puts it this way, "I want you to hear that voice. It is not a very loud voice because it is an intimate voice. It comes from a very deep place. It is soft and gentle . . . It tells us who we are. That is where the spiritual life starts-by claiming the voice that calls us the beloved." When we claim that voice, we can trust that we have become new creations in God. Like Jesus, we can choose servanthood, not from a sense of obligation or compulsion, but from the abundance of love that we know we have received. And like Jesus, we can choose to share that love as we inaugurate our own voices in proclaiming the kingdom of God. On Sunday morning, we will celebrate the fourth Sunday of Advent and we will hear once more from Luke's Gospel the story of the Annunciation. In the words of the writer Madeleine L'Engle from her essay "A Sky Full of Children," the question is posed: "Was there a moment, known only to God, when all the stars held their breath, when the galaxies paused in their dance for a fraction of a second, and the Word, who had called it all into being, went with all his love into the womb of a young girl and the universe started to breathe again, and the ancient harmonies resumed their song, and the angels clapped their hands for joy?" "Was there a moment...?" We believe that for a short time in our human history, the most complete revelation of God has walked among us, having been born of a woman. We believe that the deep longing of God's people has been answered. Mary, herself, has embodied the answer. Her story conveys truths about this most astounding of mysteries that far exceed our capacity to explain in words. It is no wonder that she stirs our imaginations and evokes strong feelings among the faithful. It is no wonder that her image suggests a bridge between the imminence and transcendence of God that speaks to our own deepest longing and hope for that same kind of holy communion that took place between mother and child. A communion in which God draws as close to us as breath and into tender embrace. If we lose the fullness of Mary's humanity, we lose the full meaning of this moment. No matter how we may have tried through the centuries to elevate her as the holy queen enthroned above, we cannot ignore that in choosing her, God has chosen to come among the poor and the lowly. The powerful and the haughty have been cast down from their thrones and the hungry will be filled with good things. When Mary sings, "He has helped his servant Israel, in remembrance of his mercy, according to the promise he made to our ancestors to Abraham and to his descendants forever," she expresses the cumulative hope of her people. We hear overtones of the prophets Isaiah, Jeremiah, Amos, and Micah and the wailing lament of the psalms crying out for the justice, dignity, and freedom that will turn the world upside down and bring in God's kingdom. Mary reminds us that the communion with God for which we wait and long depends upon our participation in these things, too, and that God's presence among us cannot be separated from them. So before we celebrate the birth of the long awaited child, we remember his mother who overcame her fear of the unknown to trust in God. The God who is coming once more in this Advent season and yet who is always with us and has never left us, in both the darkness and the light. May you know the deepest blessings of Advent and the joy of Christmas when it comes! I extend my thanks to the Rev. Dr. Phillip Bennett who has led for us in this Advent season a two part spiritual formation series entitled Christ in Evolution. Drawing heavily on the work of priest, research scientist, and theologian Teilhard de Chardin, Phillip shared with us the Cosmic Christ, the Logos, present in all things at the beginning of the creation and present now in the interdependent world in which we continue to evolve and become. In Advent, we wait "in suspense and incomplete" for the slow work of God, that progression, as Christ is further born in us. Teillhard's poem captures that movement so beautifully. impatient in everything to reach the end without delay. It is a great mystery of our faith that in Advent we await the Jesus who is already known to us and among us, and who has never left us. That we await the arrival of the kingdom of God of which we catch glimpses from time to time, but is not here always and is still coming. And that we feel the presence of God when we gather in community to look and to watch again for the coming of the light that the darkness cannot overcome. Still, this season insists upon a response from us that is more active than simply waiting and looking for God's activity in the world. "To cast away the works of darkness and put on the armor of light," as we are invited to do in the collect that we heard last week for the first Sunday of Advent, requires our courage and commitment to do as Luke's Gospel instructs, to "stand up and raise [our] heads because [we trust that our] redemption is drawing near." Advent whispers to us to stand up and acknowledge both our need for God to transform our personal darkness, as well as our hope for the transformation of the world. It calls to us to "put on the armor of light," not only for the sake of our own souls, but to be bearers of that same light and hope for which the weary world rejoices. What does it look like in this season for you to stand up and carry that light and hope into the world? Beginning this Sunday, we move into a new Church year with the beautiful liturgical season of Advent. Advent invites us to look forwards and backwards simultaneously. We prepare with joy for the coming of the infant Christ into the world and we wait with longing for the return of Christ in the parousia, the original Greek word for the second coming. As we light the candles in the Advent wreath each week and move closer to the realization of the birth, our sense of expectation increases. We are more aware of God doing something new among us in the incarnation, the revelation of God in Christ. Throughout this season, as we savor beautiful readings from the Old Testament which recount the yearning of the Hebrews for their Messiah, we long for our Messiah to come again and reconcile the world to God, to bring the peace that passes all understanding. So Advent is all about good tidings and cheer? Not exactly. You may be surprised to learn that Advent has historically been considered a penitential season. We catch glimpses of that in scriptural references to judgment and accountability for our transgressions. We see it in the liturgical use of the color purple as in the season of Lent. While Advent is certainly not a somber time as in Lent, it can be a disciplined time for prayerful self-examination and attention to our own spiritual journey and relationship with God. For some, Advent may be a time when the disparity between our hopes and longings and the realities of our lives is felt acutely. It may be a time when the waiting is difficult and the coming light feels very dim. For some of us, the surrounding darkness is very present and the prospect of the holidays is not joyful. Acknowledging the ambiguity of the season, Anne Lamott writes in her book Plan B, "All I can do is stay close to God, and my friends. I notice the darkness, light a few candles, scatter some seeds. And in Nature, and in my spiritual community, I can usually remember that we have to dread things only one day at a time. Insight doesn't help here. Hope is not logical. It always comes as a surprise, just when you think all hope is lost." In the face of this, the best thing, she says, is "you have to take the next right action." If this comes close to how the prospect of Advent is feeling for you right now, take action. Stay close to the community. Come to church. Pray. Participate in the Cathedral's Advent offerings of retreat, worship, and study. Call a friend. Call a member of the clergy. Trust that our God, who is revealed in the most unexpected ways, times, and places, is coming again and is with us now. Allow yourself to be surprised by hope. We who follow Jesus are people of thanksgiving. Each week when we gather to celebrate the Eucharist together, we give our thanks and praise to God for the gift of our lives in all their complexity and fullness, including our recent losses and sorrows. May this week ahead be a time of peaceful recollection for you as you draw close to family and friends. Among those things for which I gave thanks are the love and strong sense of community which we share in our Cathedral where we are reborn in the love of Christ. The poet E. E. Cummings captures this spirit well and I share his poem below. I extend my thanks to all of you who worked so hard to make the 234th Convention of the Episcopal Diocese of Pennsylvania a success. For many years, the small, yet growing, Cathedral congregation has served this Diocese with the generous gifts of your time and love. Here is the text of my address to the Convention which contains some important history as we celebrate the 25th anniversary of our designation as the Cathedral Church. If you have any questions, please do not hesitate to reach out to me. I look forward to seeing you on Sunday for our morning service at 10am and then again for our Harvest Home potluck supper and Second Sunday Eucharist at 5pm. This weekend your Cathedral will host the 234th Convention of the Episcopal Diocese of Pennsylvania. As the Cathedral Church, the spiritual and liturgical center of the Diocese, it is a cherished privilege for us to welcome sisters and brothers from across five counties to worship together in the beauty of holiness and to offer the best of ourselves in prayer to God. We will then conduct our annual business within the faithful frame of that holiness and prayer. The Church of The Church of the Saviour, our former name, was designated as the Cathedral Church in 1992 by the Convention and by the Rt. Rev. Allen L. Bartlett, who had served as the Dean of the Cathedral in Louisville, Kentucky prior to his election as the XIV Bishop Diocesan of Pennsylvania. Bishop Bartlett understood well the gift that a Cathedral could be to a Diocese and its unique expression of God's grace in Jesus Christ. At this Convention, our Cathedral will celebrate its 25th anniversary. We will mark the occasion by presenting Bishop Allen Bartlett with a gift as a sign of our appreciation for his special role in creating the Cathedral, and for his leadership and wisdom. At Convention, I will also tell the story once more of how, by the grace of God, we got from there to here. If you have not yet had an opportunity to read in the Diocesan magazine Caminos my piece, "The Cathedral Development Project: A Walk of Faith and Grit", you may access it here. This Sunday, October 29th, at 3pm we will celebrate in the Philadelphia Episcopal Cathedral an ecumenical commemoration of the 500th anniversary of the Reformation. As a Cathedral in the Anglican tradition which historically has provided a bridge and middle way between Roman Catholicism and Protestantism, this is a particular privilege and joy for us to host. We will be joined by religious leaders and members of many Christian denominations as we celebrate our common baptism in Jesus Christ. The Episcopal Diocese of Pennsylvania and the Philadelphia Episcopal Cathedral have a long history of ecumenical relationship. Our covenant with the Southeastern Pennsylvania Synod of the Evangelical Lutheran Church in America (ELCA) known as Called to Common Mission (CCM) has been a model for dialogue and shared ministry throughout the wider Church. Our immersion font in the Cathedral was, in fact, a gift from the ELCA in loving recognition of this special relationship. The Rev. Dr. Gordon Lathrop, the former Chair of Liturgics at the Lutheran Seminary at Philadelphia, theologian, author, and former Lutheran pastor to the Cathedral congregation, will be preaching at this service. I add that Gordon is my dear teacher, friend, and mentor. His preaching is inspirational and I encourage you to come hear it and to welcome him back! On the weekend of November 3rd and 4th, the Cathedral will host the annual Diocesan Convention, beginning with the Convention Eucharist on Friday evening at 6:30 pm. Delegates, lay and clergy, from across the Diocese will then gather on Saturday to accomplish the holy business of the Diocese. It is not too late to join our ministry of hospitality by serving as an usher or greeter. Please contact Dan Tomko in the Cathedral offices if you would like to participate. 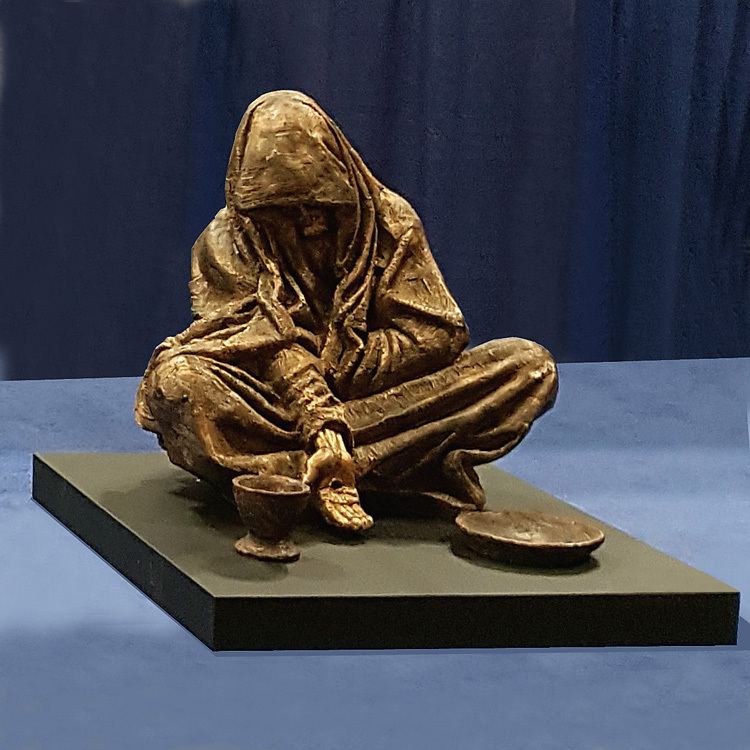 Following noonday prayer on Saturday, November 4th, our Bishop will bless the sculpture of The Hungry and Thirsty Jesus which will soon be installed in the niche on the north side of the Cathedral's front doors. Please join us for this exciting moment that marks our 25th anniversary as the Cathedral Church of this Diocese and celebrates our Cathedral Table Ministries which are such an important part of our mission and common life. In this year in which we celebrate our 25th anniversary as the Cathedral Church of this Diocese, I had occasion to review a copy of the original by-laws and charter of the Church of the Saviour, circa 1851. Among the fascinating tidbits they contain is the section dedicated to "register and rents of pews and sittings." It's hard to imagine a time when the right to a seat in this church, now a Cathedral, was purchased and the pew rents were "due on the first day of March, June, September, and December, in every year, in advance." Thank God, we have come a long way since then! Inside our doors where everyone has an unconditional seat, we have received many gifts for which we rejoice and give thanks. We are nourished each week by the Holy Scriptures and by the sacrament of the Eucharist. We experience God's presence in the midst of our community, in the faces of those whom we have to come to know, love, and serve. We pray. We feed the hungry. We care for one another and our world. We leave renewed, full of hope in the promises that God has made to us in Jesus and strengthened by the Holy Spirit to live our Gospel faith in the wider world. In thanksgiving and in response to these good gifts of God, each member of the Cathedral community is called to give of themselves. Many in our community share their time and talent, and we are also called to give financial support at a level which is appropriate for our circumstances and which reflects the importance of the Cathedral in our lives. A pledge is a faithful expression of thanksgiving for these loving gifts of God. It is also a commitment to yourself and to God to be an intentional giver by supporting the faith community where you are nourished and sustained by the love of God. While it is a promise to give a specified amount of money in the coming year, we understand that circumstances sometimes change and that it may be necessary, on occasion, to adjust that commitment. Much like individual households, the congregation's pledges help us to know approximately how much financial support we can count on as we plan for ministries and expenses. Even with endowment income, your pledge is critical to affording salaries, outreach, music, our children's programs, heat, electricity, and snow removal to assure that the doors of the Cathedral remain open and that we continue to serve and to care for one another. Please take some time to reflect upon the level at which you will pledge this year and mail the card back to us, place it in the offering basket, or pledge directly through our website. If you would like prayerful assistance in your discernment, please do not hesitate to contact a member of the clergy for guidance. We care deeply about each one of you, and welcome the opportunity to talk and pray together. "For I was hungry and you fed me, I was thirsty and you gave me something to drink, I was a stranger and you welcomed me ..."
These words from Matthew's gospel are the centerpiece of our Cathedral Table ministries. Each week with your help and support, we are providing 150 families in our community with sustaining, nourishing food from our food pantry. Teams of congregational and community volunteers are also cooking and serving hot lunches in the Cathedral. And, beginning on Wednesdays this month, the University City Hospitality Coalition, our neighborhood partner, returns after an absence of almost twenty years to prepare and serve hot dinners, along with offering medical, legal, and social work services. All of this hospitality takes place in the Cathedral sanctuary where we offer another holy meal in the form of the Eucharist on Sundays, Mondays through Fridays at noon, and for those in recovery on Tuesdays at 5:15. We trust that God's healing love and mercy are present in these ingredients. As we celebrate the 25th anniversary of the designation of the Church of the Saviour as the Cathedral Church of the Diocese of Pennsylvania at Convention this year, it is fitting to mark the occasion by acknowledging our Table Ministries and the deep hospitality of Christ that they embody. We will be placing in the niche on the north side of the Cathedral's front doors a sculpture of the Hungry Jesus. It is, after all, his face whom we see in all who pass through our doors and his hands which we extend in love and care. Our Bishop Daniel Gutierrez will dedicate Hungry Jesus during lunch on Convention Saturday, November 4. Sculptor Tim Schmaltz will also be on hand. Please join us as we celebrate and give thanks to God for the faithful endurance of our community and its ministries represented by the presence of Hungry Jesus at our doors. For more information about how to become involved in Cathedral Table Ministries, please contact Archdeacon Pam Nesbit. If you would like to contribute financially to these ministries or to the costs associated with the sculpture and it's installation, please contact Cathedral Director of Operation Lynn Buggage. I have now arrived in the U.K. and I am wending my way north to Iona. As I process the news of the horror and heartbreak of what has happened in Las Vegas, please know that I am holding my Cathedral family in my heart and in my prayers. I encourage you to pray fervently for all those who have died, those who recover from their physical wounds, those who recover from their psychic and spiritual wounds, and those who mourn. Pray for our nation and for the enactment of sensible legislation that prevents the purchase of assault weapons that have no place in our daily lives. I also encourage you to act now. Please avail yourselves of the advocacy table in the Cathedral which will assist you in writing to your elected officials to prevent these gun related tragedies from continuing. March. Make phone calls. Send e-mails. Our democracy cannot work effectively, or perhaps even decently, if we do not exercise our privilege to participate by making our voices heard. The Kingdom will not come without us. If you are in need of pastoral assistance or a reassuring word at this difficult time, please reach out to the clergy for help and support. Please also extend your hand in solidarity, friendship, and love to all who pass through our doors, seeking the solace in God's tender and gentle mercy that we find in the gathering of our community. For Episcopalians, thinking about God is a holy pursuit. Typically, we like to think and we think a lot about the eternal questions. We are collaborative people, applying our God-given ability to reason as together we pour over the Holy Scriptures and examine the imperatives handed down to us through our tradition. Yet because we are finite creatures with limited capacities, we do humbly acknowledge that there are limits to our ability to find those answers, or even to ask the right questions. We acknowledge that we live with a degree of ambiguity about the nature of God in the world. Because one thing that we know with certainty is that even collectively we do not have all the answers, we are generally suspicious of those who claim that they do. Because we look for the movement of the Holy Spirit among differing voices and points of view, we often do not presume to impose our own. We can be a politely fractious group, careful to emphasize that we value and honor differences within the big tent of Anglicanism and within an increasingly pluralistic world. Even so, “Being of the same mind, having the same love, being in full accord and of one mind,” as we are charged by Paul in the letter to the Philippians this Sunday, is daunting for us, as it is for all Christians. “Letting the same mind be in [us] that was in Christ Jesus” is more daunting still. As Paul invites the Philippians to have the same mind as Christ Jesus, he invokes the gorgeous language of a hymn that points to Jesus’ humility, and obedience, and the self-emptying love that allowed him to put the interests of others ahead of his own to the point of death on the cross. These are beautiful, inspiring characteristics of our Lord and Savior that are that are the core of our faith. But if we for a moment only understand Jesus and his vision of the kingdom of God only in passive terms, we do not have him. We will have missed his humanity and his flesh and blood passion for the justice, righteousness, and compassionate love that can transform the world. How is God calling us forward as individuals and as a community to have the mind and be the heart and hands of Christ in this world? I encourage you to explore this question in the two upcoming Discerning Spiritual Gifts workshops being offered by the Rev. Bob Tate.